I discovered this climate model failure a while ago, but haven’t published a post about it because, if I were to compare the modeled and observed sea ice area for each hemisphere, I would need to make too many approximations and assumptions. The reasons: The NSIDC sea ice area data through the KNMI Climate Explorer is presented in millions of square kilometers, while the CMIP5-archived model outputs there are presented in the fraction of sea ice area—assumedly a fraction of the ocean area for the input coordinates. I decided to take a simpler approach with this post—to show whether the models simulate a gain or loss in each hemisphere. That is, we know the oceans have been losing sea ice in the Arctic since November 1978, but gaining it around Antarctica. See Figure 1. Then there are the oodles of climate models stored in the CMIP5 archive. They’re the models being used by the IPCC for the upcoming 5th Assessment Report. 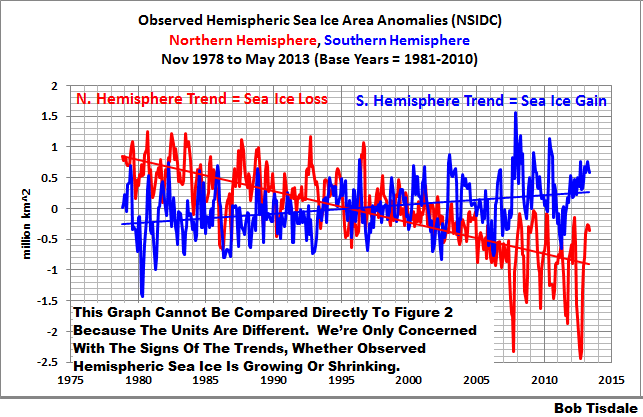 Would you like to guess whether they show the Northern and Southern Hemispheres should have gained or lost sea ice area over the same time period? The multi-model ensemble mean of their outputs indicate, if sea ice area were dependent on the increased emissions of manmade greenhouse gases, the Southern Ocean surrounding Antarctica should have lost sea ice from November 1978 to May 2013. See Figure 2. 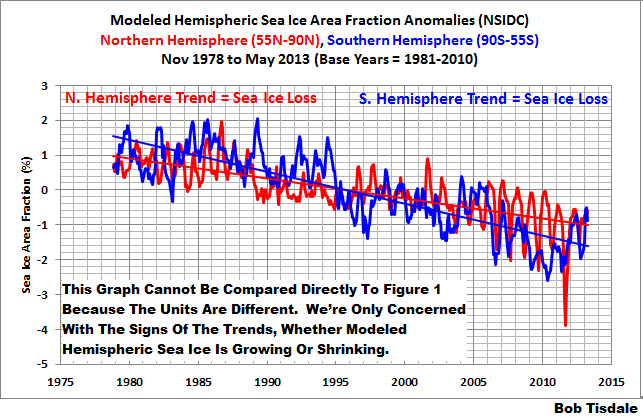 Well at least the models were right about the sea ice loss in the Northern Hemisphere. Too bad for the modelers that our planet also has a Southern Hemsiphere. We could have guessed the models simulated a loss of sea ice around Antarctica based on their simulation of the sea surface temperatures in the Southern Ocean. 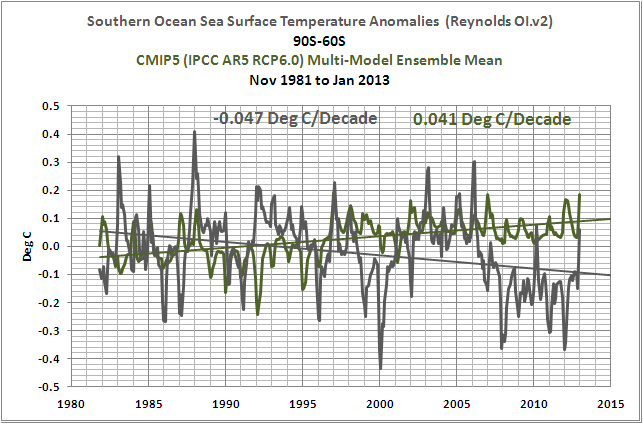 As illustrated in the most recent model-data comparison of sea surface temperatures, here, sea surface temperatures in the Southern Ocean have cooled, Figure 3, while the models say they should have warmed. And in an upcoming post, we’ll illustrate how poorly the models simulate daily maximum and minimum temperatures and the difference between them, the diurnal temperature range. I should be publishing that post within the next week. This entry was posted in Model-Data Sea Ice. Bookmark the permalink. Pingback: Model-Data Comparison: Daily Maximum and Minimum Temperatures and Diurnal Temperature Range (DTR) | Watts Up With That? Hi Bob. Interesting article. I think what we have seen as warming in the Northern Hemisphere is because of our success in systematically removing aerosol pollutants primarily over the last 30 years. This is the reason for the spike in temps and the fact that we are reaching a point of diminishing returns on how much we can remove explains why we have hit a plateau in heat gain over the past 5-10 years, confounding the Greenhouse models. You are correct that CO2 isn’t the modifier that the Scientists have predicted it is. CO2 seems to be a trailing trend. The reason we had the gain is due to our cleaner air and more suspended H2O as a result of it. The catastrophic climate models that bet on continuing progressive gains are simply wrong because their modifiers are wrong. Our successes in removing air pollution best explain the gains and also explain why their models fall apart with the new data. The cure was the cause. They’ll need to find a new boogie man to justify their research funding. Pingback: Greg Laden Once Again Expresses Something Other Than Fact | Watts Up With That? Pingback: Open Letter to U.S. Senators Ted Cruz, James Inhofe and Marco Rubio | Watts Up With That? Pingback: What Animals Are Likely to Go Extinct First Due to Climate Change? | Watts Up With That?